Say happy Valentine's day with this cute Valentine candy gift basket. 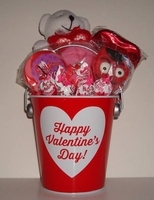 Each Valentine metal pail has a plush teddy bear, heart shaped chocolate sucker, kissable lip lollipops, heart shaped lollipop and valentine message lollipop and mini cherry pops. If you are looking for a Valentine gift Idea, this would be perfect. Adults and kids would be thrilled to get one. These also make a really cute Valentine Gift for teachers. Each Valentine pail is approx. 4" high and come wrapped in a gift bag and bow. Style of teddy bear plush varies. The pail may be different then the one shown.